The distinguished American poet, Robert Frost, was born in San Francisco in 1874 to William Prescott Frost, Jr. and Isabelle Moodie. After the death of her husband in 1885, Frost's mother moved the family to Salem, New Hampshire, where she began teaching. He attended Lawrence High School, Dartmouth College, and Harvard University. In 1895, Frost married Elinor Miriam White, whom he met in high school. A Boy's Will, published in 1913, was his first book of poetry, before which he published only a handful of poems. Winning four Pulitzer Prizes over the course of his career, Frost was by his death in 1963 considered to be one of the best known American poets of his day. 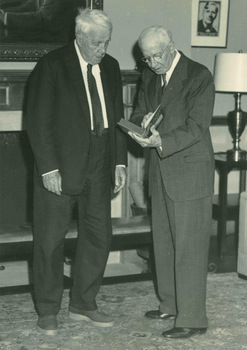 In 1952, Robert Frost inscribed a volume of his poetry, "To the Jones Library, My first serious collector and long time friend under Charles Green." Charles R. Green, the library's first director, realizing early that Frost was a most remarkable poet, began to gather every scrap of information on the poet that could be found. When Frost became aware of the collection of editions, clippings and ephemera, he presented the library with manuscripts and signed copies of his works. The Jones Library collection was thus the first major collection of Frost. Frost's donations continued throughout his life. The collection grew so rapidly during the years 1930 to 1959 that a room in Special Collections was set aside to house the materials. In 1959, the room was dedicated with Frost himself present. Since then, the collection continues to grow with gifts and purchases of materials related to Frost. It is thought to be one of the four or five richest Frost collections in the world. Frost first came to Amherst to lecture and read at Amherst College in 1916. From that time until 1963, he was intimately connected with the college and the town. From 1916 to 1920 and 1923 to 1925, he taught English and composition at the college. After giving the Simpson Lecture in 1926, he became professor of English on the John Woodruff Simpson Foundation until 1938. From 1949 until his death in 1963, he was Simpson Lecturer in Literature, spending several weeks every year lecturing and reading on campus. While in Amherst he spent much time at the Jones Library. Not only did he use the library in person, but he had books and magazines sent to him wherever he was. He also stored part of his personal library at the Jones in the 1930s. The catalog of these books is an important indication of Frost's reading habits. To learn more about the Jones Library's Robert Frost collection, view the collection guide.